I can’t believe this is passage #12. That means I’m 3 months into a year of weekly Scripture. 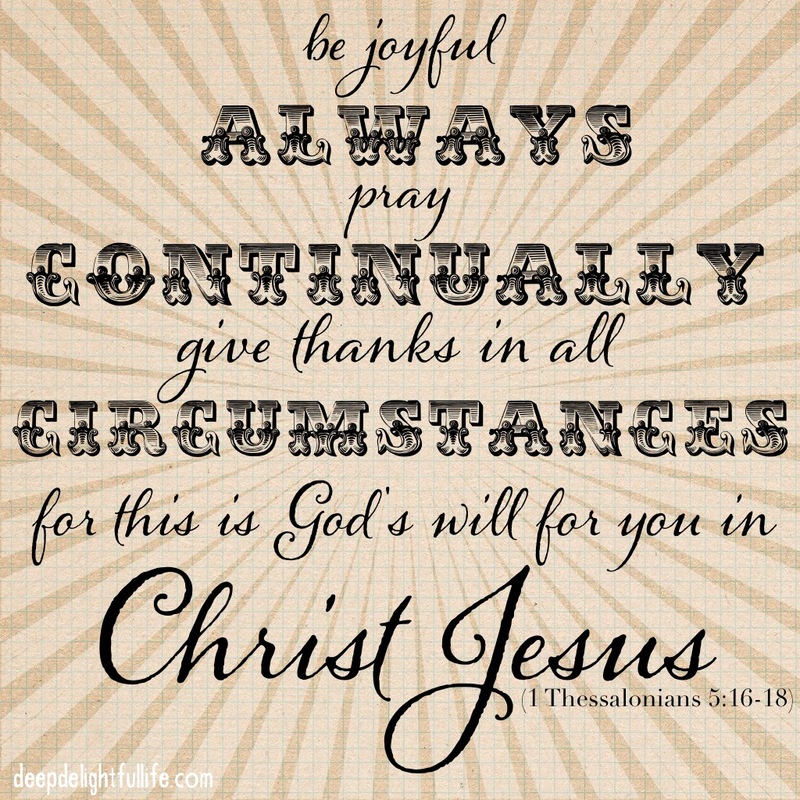 This week my passage is 1 Thessalonians 5:16-18. The Seeds song is called “Be Joyful Always,” track 12 on “Seeds of Purpose.” The song uses the 1984 NIV version, but below I have pasted the ESV. How many times do we struggle to discern God’s will for our lives? Lucky for us, this is one of those passages that literally spells out God’s will for us in black and white. Yes, I understand that when we struggle to know God’s will we are usually struggling with a specific decision or situation for which we would like a specific answer from God. I have been there, thinking, “God, just give me some detailed instructions for this situation!” But he already has, although it’s not a “take a left at the next light” kind of thing. God’s will for my life is not that I would be at a specific series of certain places at certain times with certain people, but that I would seek him and use what he has given me. I’ve seen it before but still seem to forget that if I will be joyful, pray, and give thanks, the confusion and unrest are eased and God’s will is more clearly discerned. This is a great verse on which to meditate. What is your experience with discerning the will of God? What helps you remember to be joyful, prayerful, thankful? Thanks for laying it out so simply: ‘…if I will be joyful, pray, and give thanks, the confusion and unrest are eased and God’s will is more clearly discerned…’ It IS easy to forget! Glad you were encouraged, Annette! Feel free to remind ME of this sometime; I’m sure to need it! Micah 6:8 – ” And what does the LORD require of you? To act justly and to love mercy and to walk humbly with your God.” So often we want detailed directions. I will always remember a piece of advice I was given when trying to decide what college to go to – I was told that God would be present and active wherever I went, that my job was to join Him where I saw Him working. Also, if I am rejoicing always and praying without ceasing, then my spirit will be sensitive to see where God is already at work so that I may join Him.